Disability is defined by the Equality Act (2010) as ‘a physical or mental impairment that has a ‘substantial’ and ‘long-term’ negative effect on your ability to do normal daily activities’ (HM Government, 2015). This is a broad definition that can encompass those with long-term mental health problems and life-limiting conditions such as cystic fibrosis, as well as conditions that we may more usually associate with disability, such as cerebral palsy or global developmental delays. This is important when considering estimates made using this definition. Children with disabilities will experience a spectrum of impairment, from those who experience some difficulty with one or two activities to others who will need assistance with all personal care. Similarly, there is often not a consistent relationship between a single diagnosis and impairment, functional need or disability (Department of Health, 2010). The SEND Code of Practice states that a child or young person has special education needs ‘if they have a learning difficulty or disability which calls for special educational provision to be made for him or her’. There is consequently a significant overlap between those with disabilities and those with SEN; although not all children with disabilities will have SEN and vice versa. A brief summary of the main estimates is presented below. 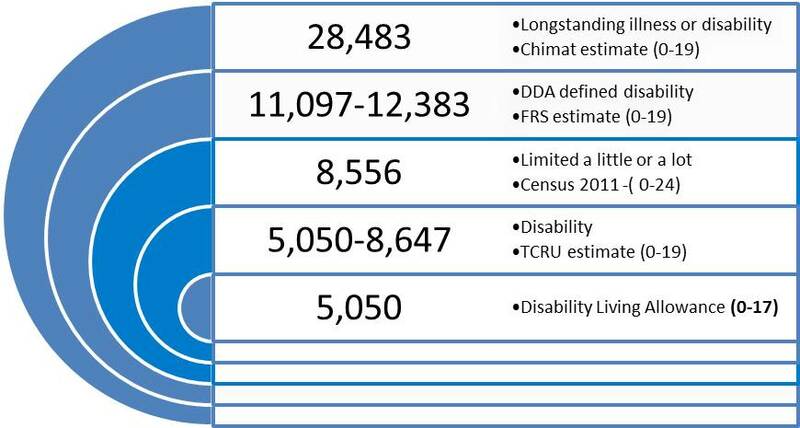 The Figure below suggests that we would expect at least 5,000 children and young people aged 0-19 to have a disability in Devon using narrower definitions such as eligibility for DLA. Using the Equality Act/DDA definition of ‘a physical or mental impairment that has a ‘substantial’ and ‘long-term’ negative effect on your ability to do normal daily activities’, this figure is likely to be much higher, in the region of 11 to 12,000; although this wider group may not all require additional support, or reach thresholds for SEN or social care. Finally, if all children who may have longstanding illnesses such as diabetes or asthma are included, this estimate is brought to almost 30,000. However, many children with such illnesses may not see themselves as experiencing limitations; as suggested by the lower estimate from the 2011 Census which includes all 0-24 year olds. Blackburn et al. (2010) in their secondary analysis of the 2004/2005 Family Resources Survey also reported the proportions of children with a Disability Discrimination Act (DDA)-defined disability experiencing substantial difficulties with specific areas of daily living. 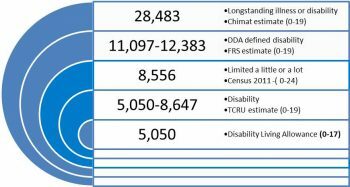 It is also possible to apply these proportions to the Devon population in order to gain approximate estimates of the numbers of children who are likely to be living with different disabilities. Table 8.6 demonstrates that we would expect more than 3,500 Devon children to experience problems with memory, concentration and learning (the most common area of difficulty), and more than 3,000 to have difficulties with communication. In terms of physical disabilities, the estimates suggest that 2,300 children in Devon experience mobility problems, more than 1,200 have impairments in manual dexterity and approximately 2,000 have coordination difficulties. We would expect over 1,000 Devon children to experience continence difficulties. Many children will of course experience difficulties in more than one area, meaning that these numbers should not be added together. There are a number of risk factors occurring before birth, in childhood and in adolescence that might increase the risk of a child either being born with a disability such as cerebral palsy, or lead to the development of an acquired disability. There are a few specific syndromes which are directly linked to genetics, such as trisomy 21 and Downs’ syndrome. However, more commonly there is a complex and non-specific relationship between risk factors and the development of a disability in a child or young person, which may involve an interaction of genes and environment. Preterm birth and low birth weight increase the risk of various types of disability; and in turn are influenced by maternal age and health, as well as by antenatal and maternity care. There are other specific risk factors which are potentially amenable to prevention, such as the relationship between low folate levels and spina bifida; and infections and trauma and acquired brain injury. Although socio-economic status may not constitute a separate and independent risk factor for disabilities, the prevalence of child disability increases as socio-economic status decreases. In particular, intellectual and developmental disabilities are strongly associated with socio-economic disadvantage, whereas the association is weaker for physical disabilities. Parents and children from disadvantaged households may be more exposed to risk factors such as inadequate nutrition, environmental pollutants, unsafe housing, tobacco smoke and infections, all of which may interact with other risk factors to increase the risk of being born with or developing a disability; as well as negatively affecting the course and severity of their condition.